It’s been quit some time since my last cooking recipe. I like creating cakes, I like creating anything that has to do with baking and decorating actually, but cooking is a pleasure for me as well. Papoutsakia is a Greek recipe, and it means little shoes. The first time I had this dish was years ago, when I was 12. We went to visit relatives in Serres, a town in North Greece, and my aunt was expecting us with a pan full of “papoutsakia”. It was love at first bite…!!! 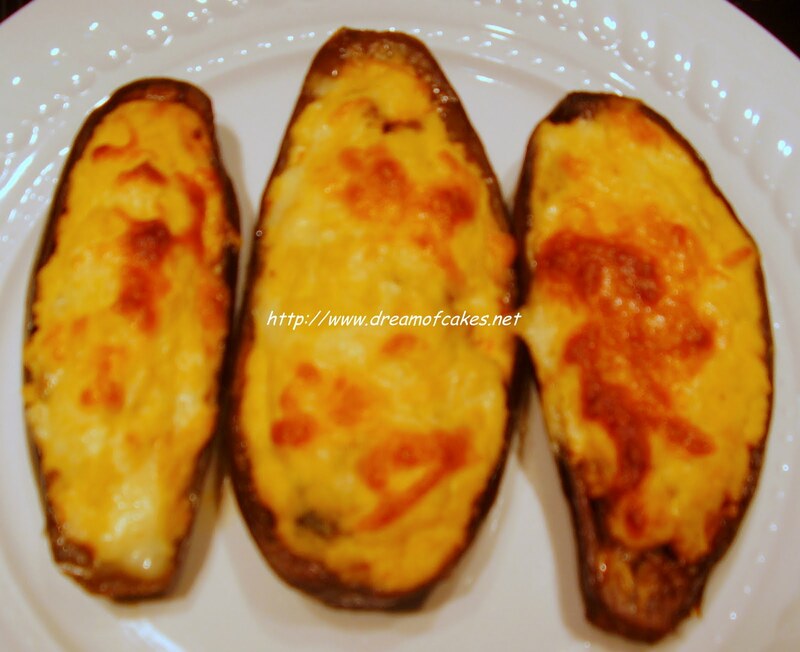 The combination of eggplants, ground meat, spices and béchamel cream were so new to me, but yet so tasty! I think it was the 1st time I was interested in learning how to cook something. The traditional recipe involves a lot of frying, but here I will give you a different, healthier and equally delicious version of “papoutsakia” recipe. Give them a try; I am sure you will love them too. I will give you the recipe for 6 servings or 3 if you are really hungry. You can multiply the recipe by the number of persons you want to serve. In the photos you will notice that my servings were much more; we are a big family :-)!! 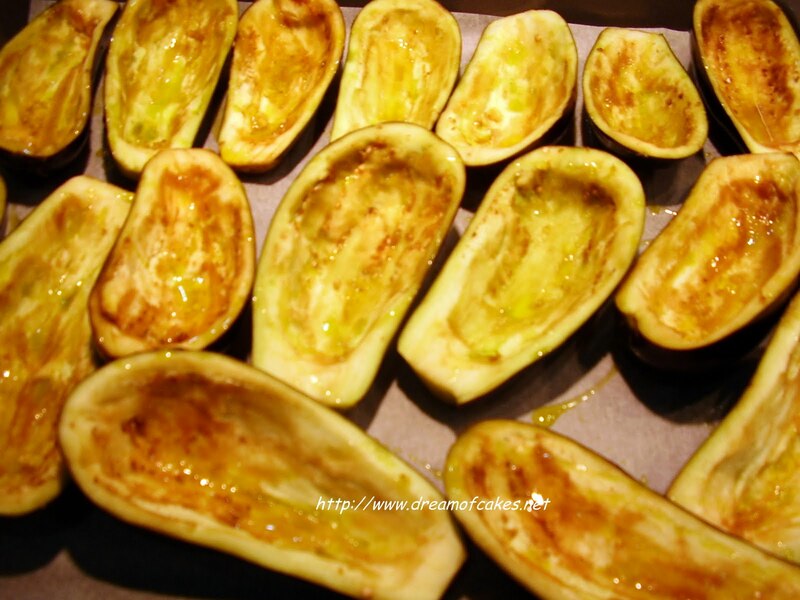 1) Cut them longwise and with the help of a teaspoon take out the core of the eggplant. Lay them on an oven tray and spray them with olive oil. Cook them in the oven grill for 15 minutes on each side. Remove from the oven and allow to cool for 5 minutes. 2) In the mean-time prepare the shoe filling. 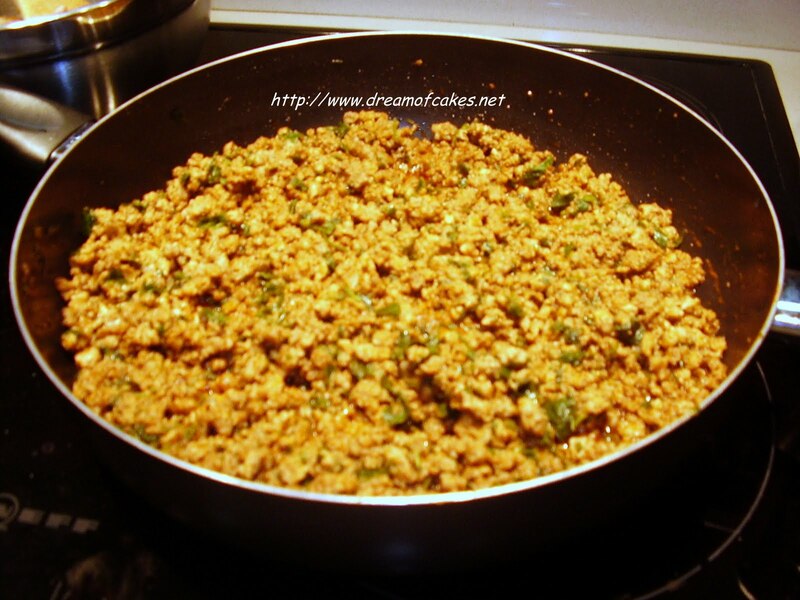 In a deep frying pan cook the ground meat with the onion and the rest of the olive oil. Just before well cooked add the rest of the ingredients (not the parsley). 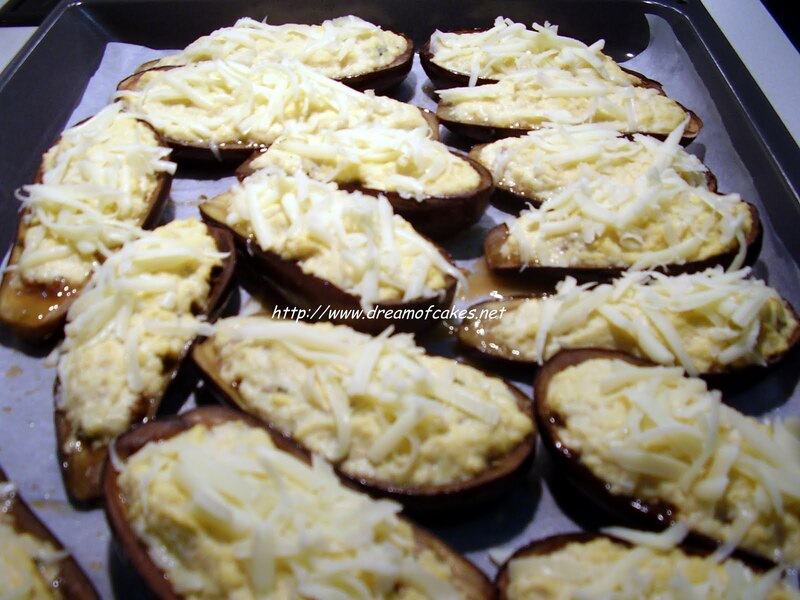 You can add the core of the eggplants as well (cut into small cubes). Stir well and allow to cook until there is no liquid left in the pan. Remove from the heat and add the parsley. Mix well and fill with this mixture the eggplants. Allow space for the béchamel cream. 3) In a medium saucepan, heat the butter over medium heat until melted. Add the flour and stir until smooth. Over medium heat, cook until the mixture turns a light, golden color, about 5 minutes. Meanwhile, heat the milk in a separate pan until just about to boil. Add the hot milk to the butter mixture, whisking continuously until very smooth. Bring to a boil. Cook 10 minutes, stirring constantly, then remove from heat. Beat the egg with a bit of milk. Add it to the cream. Season with salt and pepper. 4) With the help of a spoon poor the cream on top of the ground meat. Sprinkle with the grated cheese. 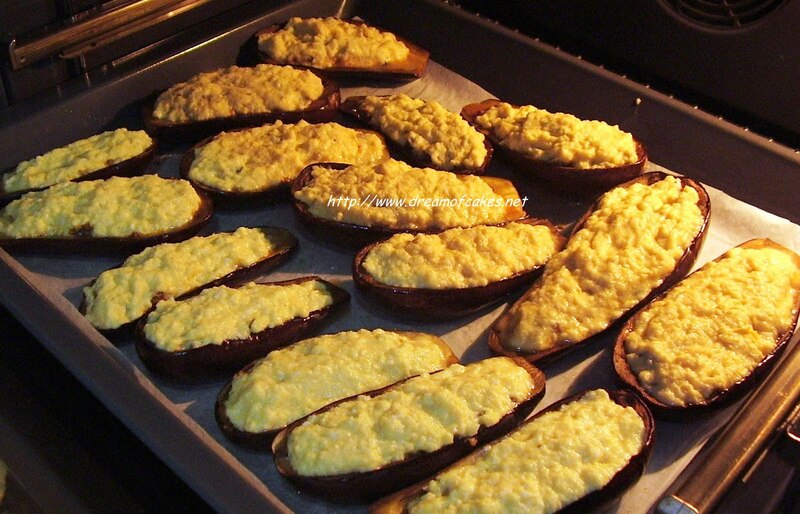 5) Cook in a preheated oven to 180ºC, for 30 minutes or until golden brown. Serve hot with a green salad. Wow - looks amazing! I love eggplant anything! It almost reminds me of a de-constructed moussaka. Little shoes, cute name for this dish. love that melting cheese sauce on top. A new dish for me, but such a winner! These remind me of my childhood. My mother used to make a very similar stuffed eggplant - I don't much meat any more but thanks so much for the memory lane and the reminder that it's stuffed eggplant time again ... only with a veggie filling now :) BTW cute name. Mmmmmm...that looks so good! I made something similar tonight but just stuffed my eggplants with a tomato and veggie stuffing with bread crumbs. I actually roasted my eggplants first and then hollowed them out. Should have done it your way! This is so meaty and yummy, love it. Oh cool it's like a variety on a moussaka, looks really good! oh goodness this looks absolutely delicious! "little shoes" ... the name itself made me giggle. hehe. this looks delicious. so cheesy and meaty!yum! 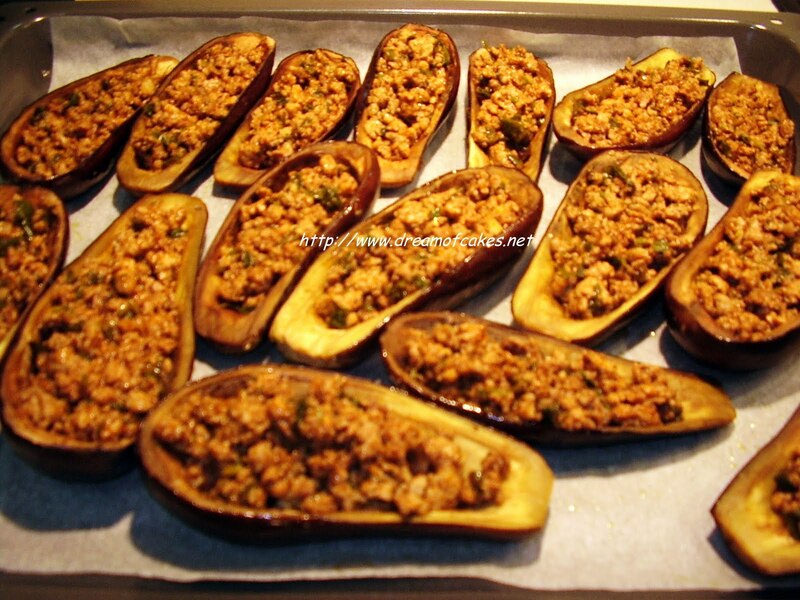 it's great to see more eggplant recipes coz it's a good vegetable but it doesn't get used much in cookng sadly. 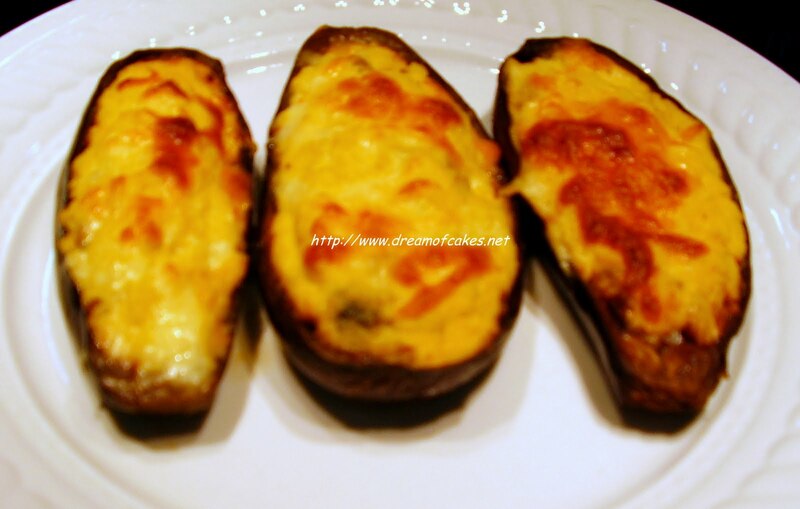 Oh I can't wait to try these....I love eggplant and this looks like an excellent dish. Thanks for sharing!